Fulham missed the chance to narrow the gap on second-placed Cardiff to five points as they let slip a two-goal lead to draw with QPR. Tom Cairney found the bottom corner from 20 yards and Lucas Piazon finished a neat move to put Fulham in control. But Rangers pulled one back before half-time, Massimo Luongo volleying in from Matt Smith's header across goal. QPR dominated after the break and Pawel Wszolek levelled with a composed finish after Denis Odoi conceded possession. Ian Holloway's mid-table visitors came closest to a winner when Jake Bidwell's cross had to be beaten away by Marcus Bettinelli. 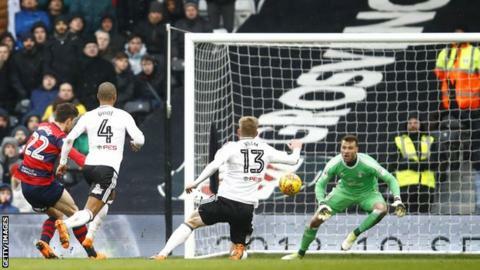 For Fulham, the point was enough to set a club record of 16 league games unbeaten, and they moved into third place on goals scored before Aston Villa's trip to Bolton at 17:30 GMT. Slavisa Jokanovic's Cottagers had Ryan Sessegnon's tap-in rightly disallowed for offside and briefly played with swagger after Cairney's precise opener. However, sloppiness set in before QPR's first, from a set-piece, and Poland wide man Wszolek claimed his reward for an impressive display with a well-taken equaliser. "We cannot be satisfied. I am not here to fight for records, I am here to win the games. We didn't win. I cannot be satisfied. It's [the record] not important to me. "We managed to score two goals, we had it under control, but the first goal they scored caused important damage. "After one unforced mistake they scored the second goal. They deserved that goal because they made a few important entrances and had some chances, half chances. "We didn't try to change the style. We had possession but without taking on defensive lines. Our solution cannot be to change the style, and we didn't try to do that." "As the game went on, I'm disappointed we didn't end with three points. I'm delighted with the character. "I needed half-time to have a rant and say 'wait a minute, get a bit closer to people'. I was fuming. "I told them to get after people and luckily for me my subs helped. We got about them and we deserved what we got. "I believe in my team and we what we are doing. Do I expect young lads to be consistent? Not really. But I will teach them." Match ends, Fulham 2, Queens Park Rangers 2. Second Half ends, Fulham 2, Queens Park Rangers 2. Joel Lynch (Queens Park Rangers) is shown the yellow card. Attempt saved. Jake Bidwell (Queens Park Rangers) left footed shot from the left side of the box is saved in the bottom right corner. Assisted by Pawel Wszolek. Attempt missed. Rui Fonte (Fulham) header from the centre of the box is close, but misses the top left corner. Assisted by Stefan Johansen with a cross following a corner. Corner, Fulham. Conceded by Darnell Furlong. Floyd Ayité (Fulham) wins a free kick on the left wing. Offside, Queens Park Rangers. Jordan Cousins tries a through ball, but Jake Bidwell is caught offside. Matt Targett (Fulham) is shown the yellow card for a bad foul. Delay in match Paul Smyth (Queens Park Rangers) because of an injury. Foul by Matt Targett (Fulham). Paul Smyth (Queens Park Rangers) wins a free kick on the right wing. Foul by Paul Smyth (Queens Park Rangers). Attempt saved. Floyd Ayité (Fulham) left footed shot from the centre of the box is saved in the centre of the goal. Corner, Fulham. Conceded by Jake Bidwell. Goal! Fulham 2, Queens Park Rangers 2. Pawel Wszolek (Queens Park Rangers) right footed shot from outside the box to the bottom right corner. Stefan Johansen (Fulham) wins a free kick in the defensive half. Attempt saved. Paul Smyth (Queens Park Rangers) header from the centre of the box is saved in the top right corner. Assisted by Jake Bidwell with a cross. Substitution, Fulham. Sheyi Ojo replaces Ryan Sessegnon. Substitution, Fulham. Rui Fonte replaces Tom Cairney. Corner, Queens Park Rangers. Conceded by Tim Ream. Attempt missed. Floyd Ayité (Fulham) right footed shot from outside the box misses to the left. Attempt blocked. Luke Freeman (Queens Park Rangers) left footed shot from the centre of the box is blocked. Assisted by Paul Smyth with a cross. Substitution, Queens Park Rangers. Jordan Cousins replaces Ryan Manning. Offside, Queens Park Rangers. Alex Smithies tries a through ball, but Pawel Wszolek is caught offside. Substitution, Queens Park Rangers. Paul Smyth replaces Eberechi Eze.